Women’s History Month could not pass without honoring Eleanor Roosevelt, First Lady and so much more. 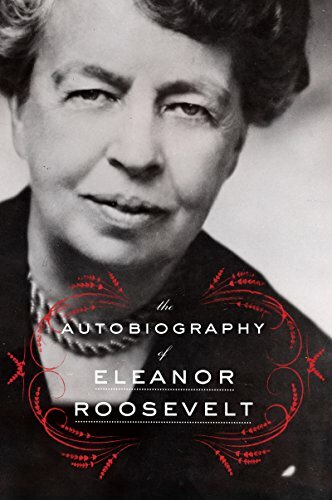 There is little I can add to the volumes that have been written about her life, her contributions to the career of her husband, Franklin Roosevelt, and her later contributions to the United Nations. Instead I will tell you about some of what I admire about her. 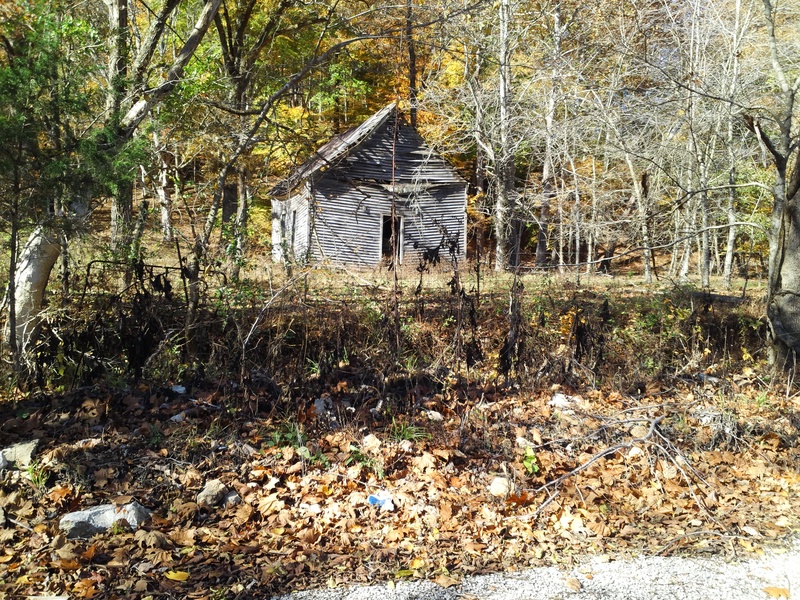 Although her family was wealthy, she was a shy child from an unhappy home. 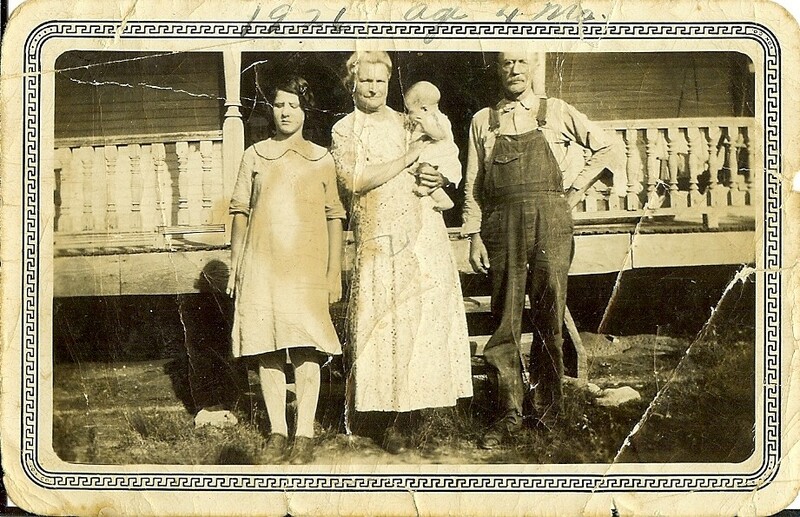 Her mother died when she was young and her father was an alcoholic so Eleanor was raised by her grandmother. As she grew to adulthood she overcame her shyness and ventured out into society. When she married her handsome, distant cousin, Franklin, she would have been content to be a wife and mother, but her husband’s political ambitions threw her into the public arena. This public role would not have been her choice but she rose to the challenge. Even as First Lady she went beyond the expected role of managing social events and became her husband’s eyes, ears and legs. She traveled the country making speeches, listening to people in all walks of life and reporting back to the White House. It took a lot of inner strength to overcome her early life and become a force in Washington. The quiet little girl became a savvy political figure who promoted women’s causes whenever she could. She encouraged her husband to appoint women to various positions in his administration. In a time when women reporters were not allowed in the White House news conferences, Eleanor began holding her own news conferences for women only. After Franklin’s death, President Truman appointed Eleanor as delegate to the newly formed United Nations. There she led the fight for resettlement of refugees and she is considered largely responsible for the Universal Declaration of Human Rights which is still protecting human rights around the globe. Another thing that garners my admiration is that Eleanor was a writer. Beginning during her tenure in the White House, she wrote a daily newspaper column “My Day” that was syndicated in newspapers across the country. This would have been the equivalent of writing a daily blog today. 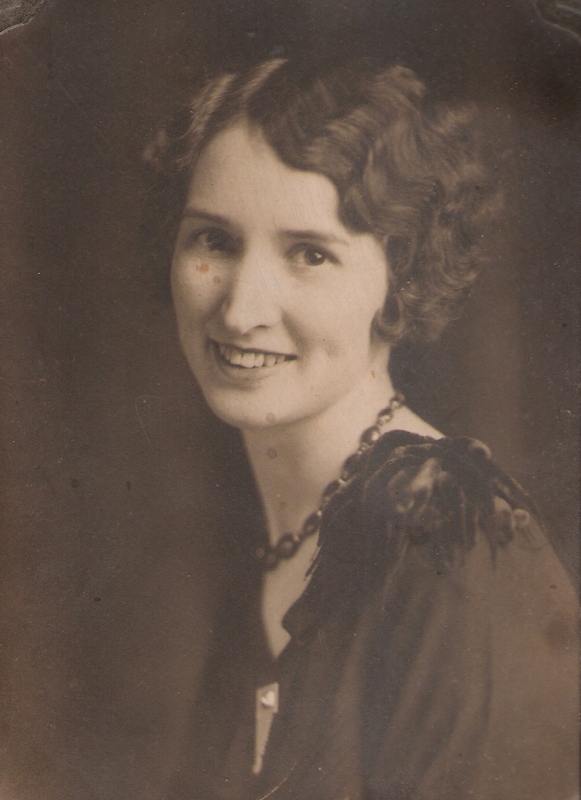 She also wrote regular columns for several magazines and had a weekly radio broadcast. After leaving Washington Eleanor wrote four autobiographies and several other books. These books are still available. I treasure my copy of the combined autobiographies. The money she earned from this column and from her books she donated to charity. That brings me to another thing I admire about Eleanor Roosevelt. Her charity and compassion for the people. She gave her money and she gave of herself to better the lives of others. 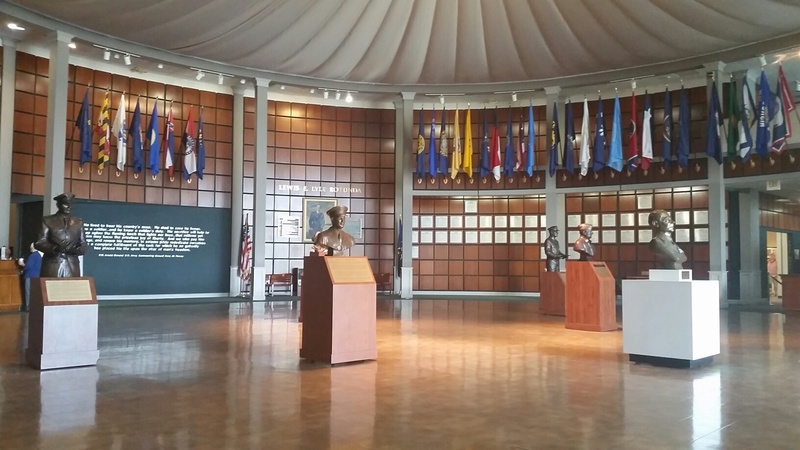 Something that many people don’t know about Eleanor is that at the beginning of World War II when the Japanese attacked Pearl Harbor, Eleanor spoke to the American people about the attack before her husband’s famous speech to Congress. It was Sunday, December 7, 1941, and her weekly radio broadcast was scheduled to go on the air that evening. While Franklin consulted with the country’s leaders, Eleanor went on the air and talked to the people in her kind and compassionate style. 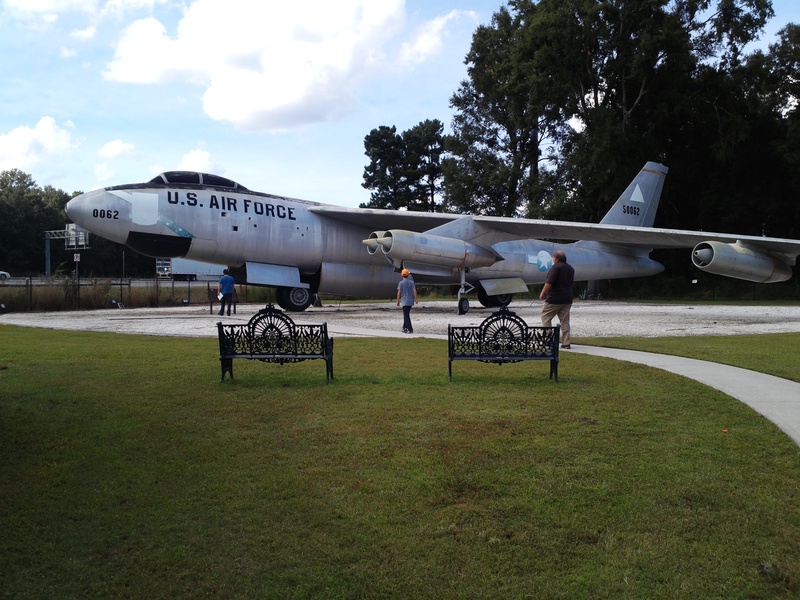 She could relate to the feelings of fear families had because she too was a mother who had four sons of the age for military service. Two of her sons were already in the military. She knew what was coming and she knew the people needed to hear a message of hope and courage so that is what she gave them. Listen to her words in the attached You Tube recording. How could you not admire a woman like that. 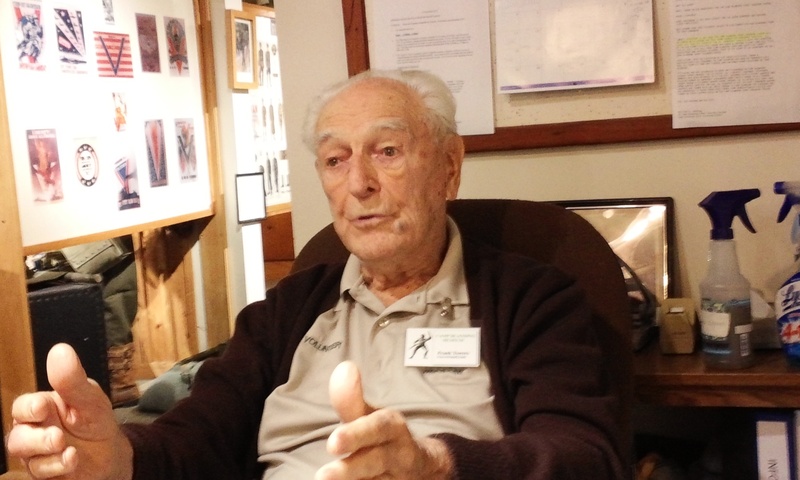 This is the second post in a series following the 117th Regiment (originally the Tennessee National Guard) of the 30th Infantry Division through their World War II combat experiences. My primary reference has been an excellent and detailed account of the 30th entitled “Workhorse of the Western Front – The Story of the 30th Infantry Division in World War II” by Robert L. Hewitt. 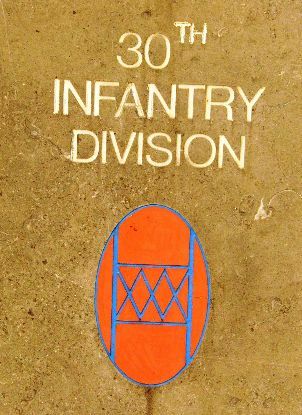 I have also gleaned valuable information from the Unit History of Company B, 117th Regiment and the 30th Division Old Hickory websites. As I continue to research the 30th, I find their story more and more fascinating. I hope you do, too. 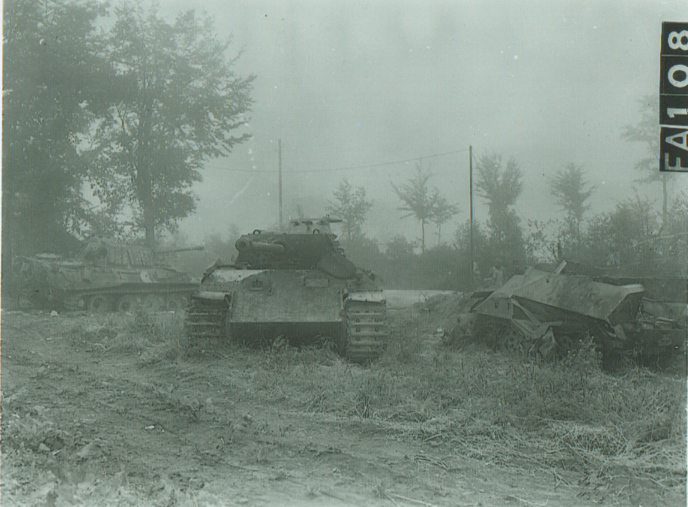 The fighting around Mortain ended on August 13, 1944. With no time to rest the 117th Regiment and the entire 30th Infantry Division moved northeast encountering some enemy opposition but nothing substantial. 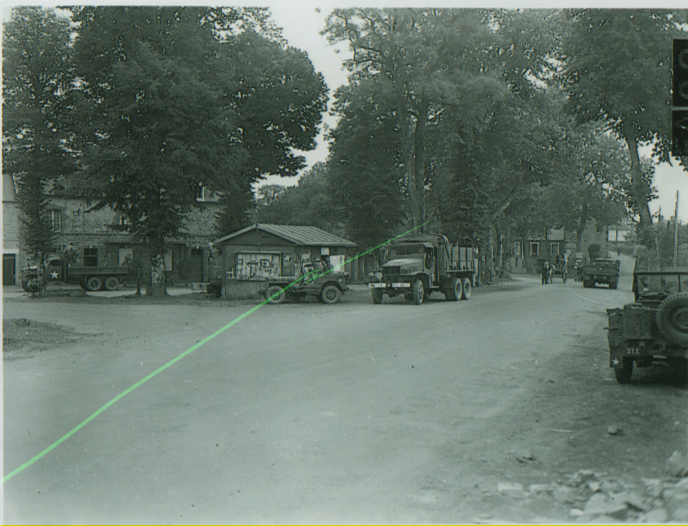 After crossing the Seine near Mantes-Gassicourt, some 25 miles west of Paris, the 117th relieved the 79th Division. 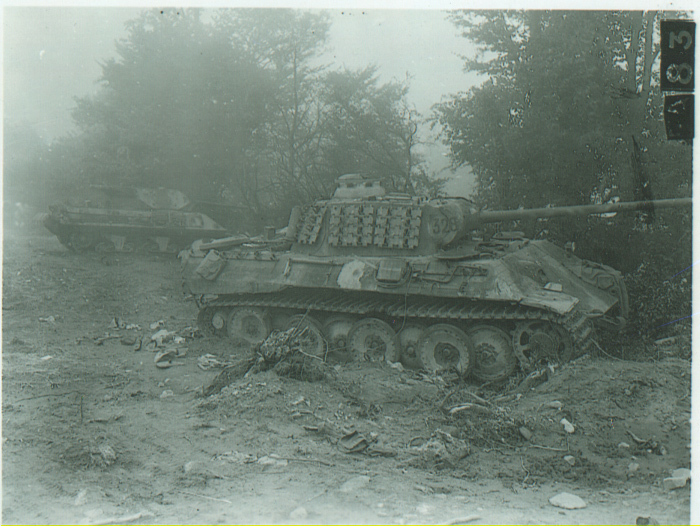 It took them two days to clear the German defenders from the high ridges on the north bank. By August 30 enemy opposition along that section of the river collapsed. Orders came for the 30th to proceed to the French-Belgium border as part of a First Army task force commanded by Brigadier General William K. Harrison Jr. 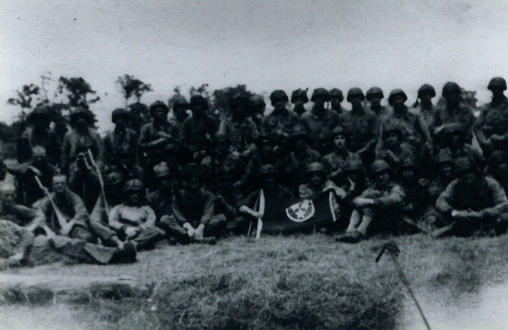 Without enough trucks to transport the entire division, the 117th remained behind in reserve while the 119th and 120th along with various support units – 125th Calvary Squadron, 30th Reconnaissance Troop, 743rd Tank Battalion, 118th Field Artillery Battalion, Company “A” 105th Engineer Battalion, and Company “A” 823rd Tank Destroyer Battalion – headed for Tournai, Belgium. 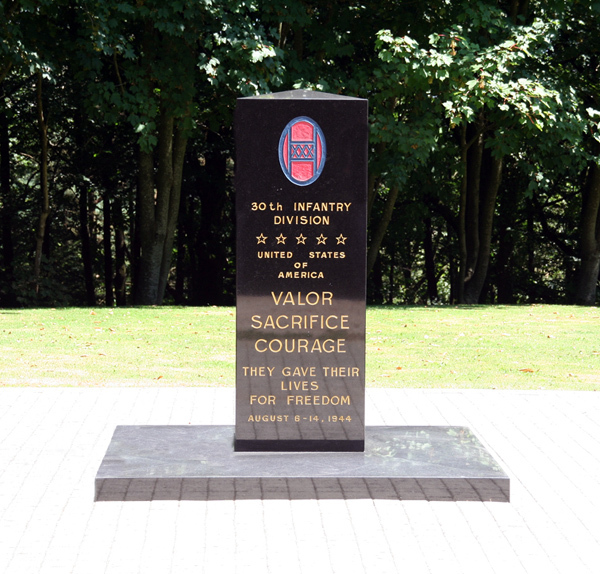 After beating back the German rear guard, who attempted to delay the Americans while the bulk of their army retreated, the 30th Infantry Division became the first American division to enter Belgium on September 2, 1944. The 117th Regiment followed on September 4, camping near the famous Waterloo battlefield. 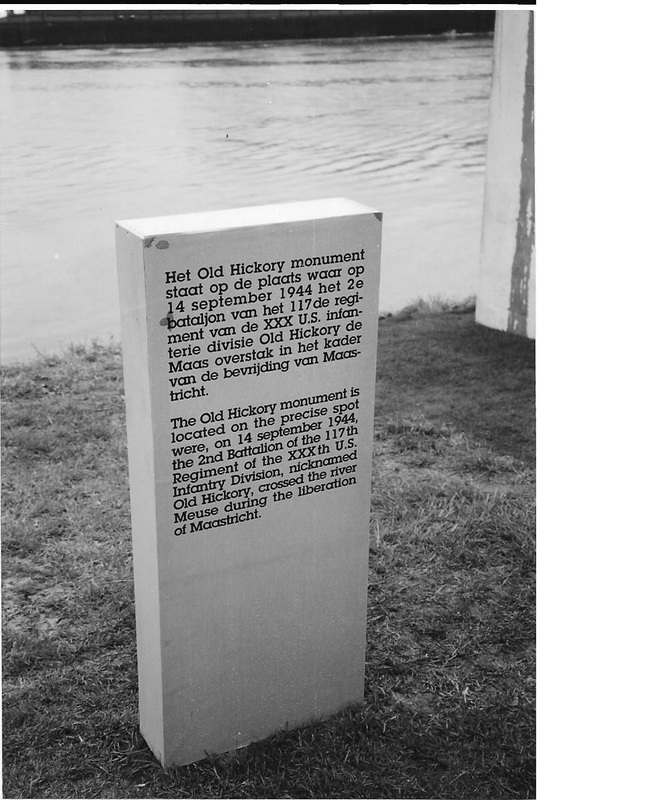 Assuming the Germans would take a stand at the Meuse River, command ordered “Old Hickory” to proceed across Belgium toward the Meuse and the southern border of Holland. Lack of gasoline forced the soldiers to go on foot, slogging through the rain and mud for the over one hundred mile trek. What would have taken one day by truck became an exhausting three-day march. 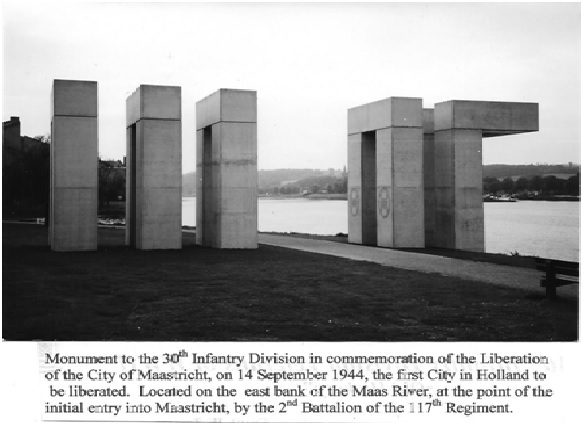 On the west bank of the parallel waterways of the Meuse/Maas River and the Albert Canal, the 30th poised west and south of Maastricht, Holland, readying their attack on the most heavily fortified area along the border between Belgium and Holland. Organizing the scattered units of their retreating forces, the Germans scrambled to man the natural and man-made defenses in an effort to slow the Allies advance. Attacking on September 10, “Old Hickory’s” regimental columns moved forward with the 117th to follow the 119th. 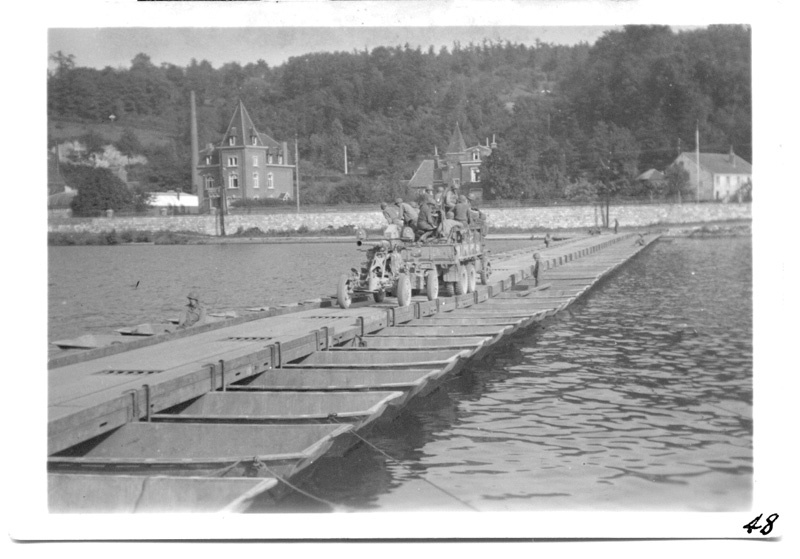 Despite the enemy blown bridges at Vise, Belgium, south of Maastricht, the 119th managed to cross the dual waterways. At the same time the 120th took the locks on Maastricht Island, further north, and then proceeded to capture the famous Fort Eben Emael finding the Germans had deserted it. By the morning of the 12th the 117th streamed across the river at Vise. Company A of the 117th pushed northward and became the first Allied unit to cross the Belgium-Holland border and enter Holland. Lieutenant Elwood G. Daddow, Company B, 117th Regiment, defied the danger of a German counter-attack to retrieve a dispatch case from a damaged German command car. The case contained papers and maps indicating the German plans for withdrawal and deployment of their forces along the Siegfried line as well as other pertinent data. With the extensive enemy reorganization due to their rapid retreat to the German border, this intelligence proved invaluable. 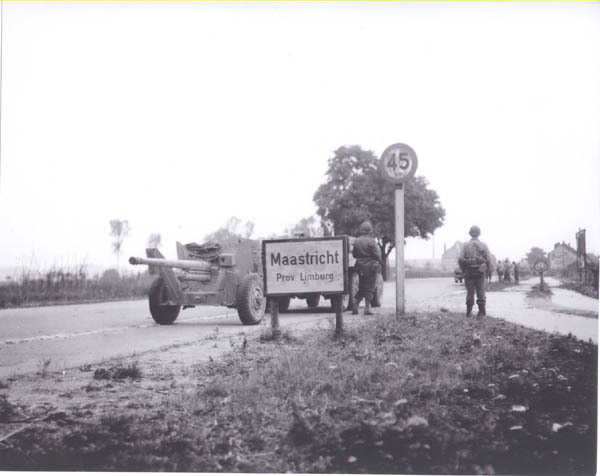 The battle for Maastricht and the surrounding area continued through September 14th with ongoing counter-attacks by the Germans. 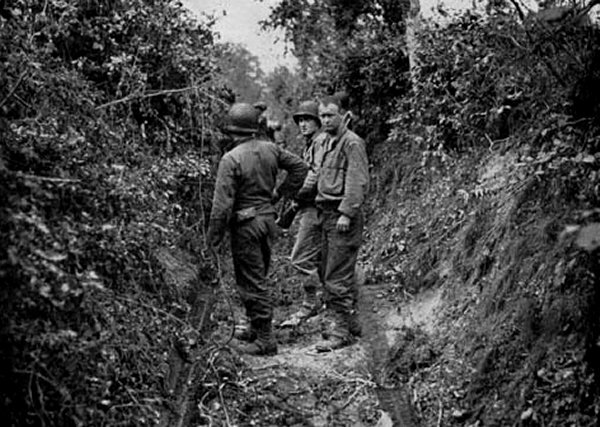 Pressing eastward “Old Hickory” pushed on toward the Siegfried Line also known by the Germans as the West Wall. 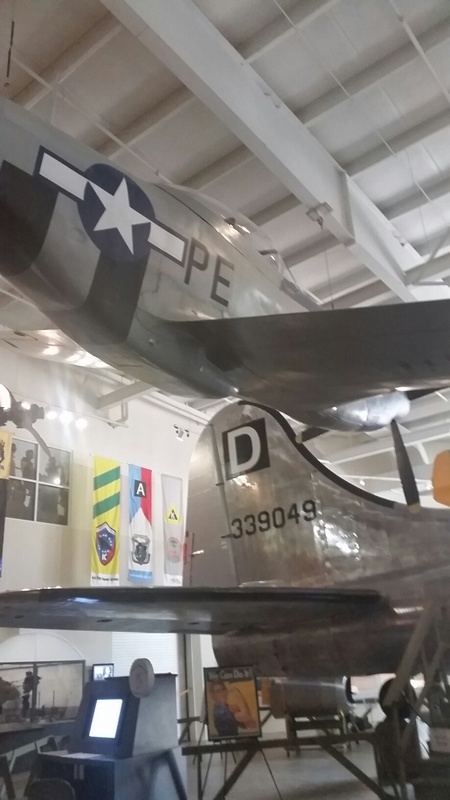 Significant enemy artillery fire greeted the Americans for the first time since Normandy. 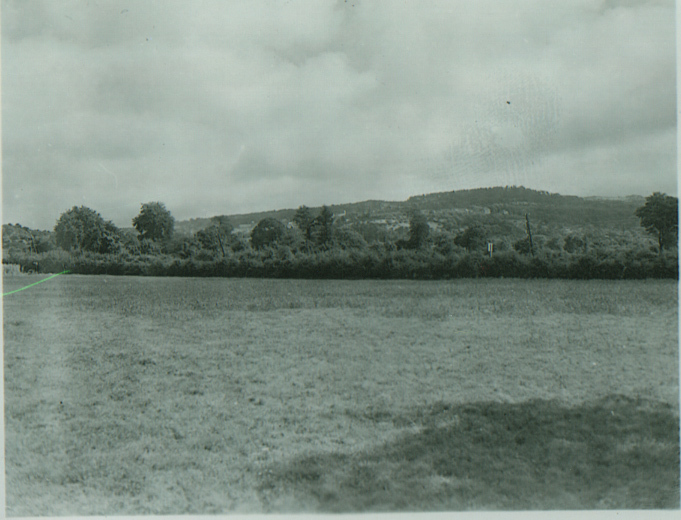 On September 18 the 117th took up positions facing the Siegfried Line near Scherpenseel. 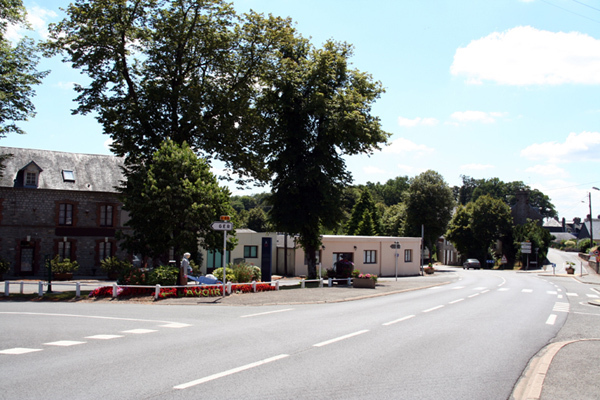 In the weeks since leaving Mortain, the fighting and the casualties had been light compared to Normandy. The demonstration of welcome in the towns liberated along the way was different as the 30th moved from France and its wild hugs and kisses to Belgium with its enthusiastic greetings to Holland with its smiles and waves. All were equally glad to be freed from the German occupation but the Americans learned quickly that the cultural differences between the countries meant there were differences in how they showed their gratitude. In mid-September, with supplies still being brought ashore on the landing beaches of Normandy and supply lines stretched for hundreds of miles across France and Belgium, the shortage in all essentials from fuel to ammunition to food forced the Allies to halt their advance. An attack on the German homeland called for not only sufficient men and equipment but also the essential supplies to sustain the push into Germany. So the 30th settled in waiting for the Red Ball Express to deliver the much-needed materiel. They utilized the time in planning and training for the coming battle, along with a little rest and relaxation for the men, including hot showers, hot food and movies. 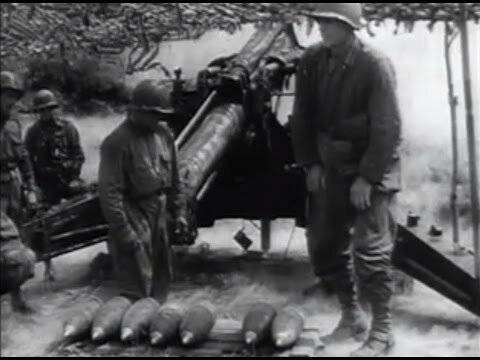 Although the 30th had trained in the U.S. for three and a half years before embarking for England and had trained for months in England before landing in France, the tremendous casualty rates left few men who had specialized training in weapons like the flame-throwers, bazookas, or demolition charges that would be needed in assaulting the Siegfried Line pill boxes. Command decided that everyone should be trained in all weapons and instituted an intense training program. This training allowed the replacements and the recently promoted non-com’s and officers to forge themselves into effective fighting units. To prepare for the assault on the Siegfried Line specific information on the terrain ahead was compiled utilizing aerial photographs and reconnaissance patrols into dangerous enemy territory. With this information an elaborate sand table model was constructed in the command post. The sand table gave the men a visual representation of what lay ahead and what their specific objectives were. Men were rotated off the line to study the terrain depicted on the sand table. This detailed preparation would prove invaluable in the assault into Germany. 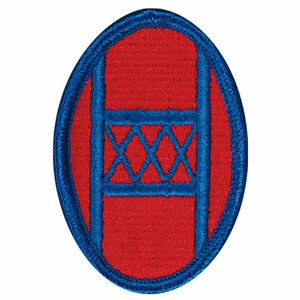 The 117th would breach the Siegfried Line and go on to help take Aachen, but more about that in the next post.